Comments: Jon Yamasato set foot into the music scene at the tender age of 18 playing underground gigs at coffee shops, clubs and bars. 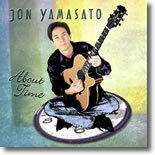 Jon went on to form the band "Pure Heart" which won 5 Na Hoku Hanohano Awards. He has also performed and recorded with some of the biggest names in Hawaiian Music including Dennis Kamakahi, Keali`i Reichel, ` Ale`a and Justin Young. This album reflects his experiences of fun and growth and also expresses an appreciation to those who supported him and his muisc over the last 10 years.